Christmas-baking burnout lasted a little longer than usual this go-round. By the time Boots was begging for cookies Saturday, it’s been going on six weeks since I’d last seen an Air Bake. At least I think he was begging for cookies. When he says it, it sounds more like “kooky,” so maybe he’s just one of the many people who question my sanity. Giving him the benefit of the doubt, though, I hit the recipe box and dug up this gem from a long-ago roommate. It’s crunchy on the outside and almost brownie-like on the inside even though it’s not thick at all. My roommate used to make them the size of saucers, but not wanting to deal with a kooky sugar buzz, I shoveled mine out with a standard melon scoop. Cream shortening and sugar, then add egg replacer and vanilla and mix well. Combine dry and add alternately with milk. My cheapy hand mixer was barely able to do this, and I might well have burned it out. I suggest a stand mixer if you have one. Drop on greased cookie sheets and bake 10 to 12 minutes at 350 degrees. Mine took 15 minutes on Air Bake. I put the sprinkles on before baking, smooshed the cookie just enough to flatten it so everything didn’t roll off. 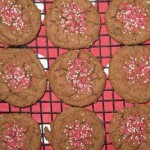 Another easy to bake eggless cookie recipe. I too love crispy exterior and soft centred cookies. Have you tried sugar cookies using EnerG? I have to try it out.